This essay discusses the background for the Wakefield Experiments. This refers to two sets of experiments performed by Tony Wakefield an Australian amateur radio operator, or ham, who performed these experiments for Ivor Catt. The objective of these experiments was to verify the predictions made by Ivor Catt based upon his Theory C. This theory asserts several things. First, that a capacitor is a transmission line, and second, that there is no static charge in a capacitor, but that the stored energy consists of a reciprocating wave of energy that surges back and forth in a continuous cycle. The objective of the Wakefield experiments was to demonstrate this internal motion of electromagnetic waves inside a charged transmission line. What is most interesting about these experiments is that they conclusively demonstrate that the textbook theory of the discharge of a capacitor is not correct. In other words the standard textbook theory that a capacitor produces an exponential decay of current is not observed in the Wakefield experiments and that the experiments do produce results that confirm the Theory C of Ivor Catt. A second and more significant issue is that the facts behind this dis-confirmation of standard electrical theory have been known for more than 50 years. In addition to this, the elements of the correct theory have been known since Oliver Heaviside developed the theory of waves on transmission lines from Maxwell’s theory of electricity and magnetism. What has been lacking for almost 135 years is the correct approach to understanding the theory of electromagnetic waves and its implementation in the teaching syllabus of the physics educational system. This is what Ivor Catt has hoped to achieve in his Theory C, which unfortunately has been blocked by the physics establishment, who persist in perpetuating the old outmoded ideas of electricity and magnetism as based upon physical objects that possess charge. The beginning of modern electromagnetic theory has its roots in the discovery by Christian Oersted of the magnetic effect of the electric current in 1820. This discovery, which was based upon the idea of the unity of all of the forces of nature, created the science of electricity and magnetism. Oersted’s discovery was followed by a frenzy of discovery by Ampere, Faraday and others. In the 1860s, during the American Civil War, James Clerk Maxwell developed a theory of electricity and magnetism that culminated in the claim that light was an electromagnetic wave. The full development of Maxwell’s theory into what we today refer to as Maxwell’s equations was due to the work of Oliver Heaviside and Heinrich Hertz. Unfortunately, at the same time as Heaviside was perfecting his electromagnetic theory of waves, J.J. Thomson announced his discovery of the electron. This was soon followed by Einstein’s special theory of relativity. These developments, in particular the special relativity theory, had a dramatic negative impact on the development of physical ideas regarding the nature of electricity and magnetism. The practice of electromagnetic theory that resulted in radio and electronics became the province of the electrical engineer and practicing technologists, while physics went in the direction of the study the microphysical world. Physicists believed that the phenomenon of electricity was caused by electrons and other elementary particles that possessed charge, and as a result of special relativity denied the existence of the aether. This second belief had serious consequences for the classical Maxwellian electromagnetic theory. That theory became forgotten, except by the engineering technologists, and effectively the ideas that we have today became frozen in time at the knowledge that existed in about 1920. By the 1930s the last remaining vestiges of the aether had been removed from the engineering textbooks as well as the physics curriculum. During this period, the rapid advances of electronics, seemed to confirm the electron theory of current, although there were some areas of divergence. The theory of transmission lines and electromagnetic waves became the province of the electrical power transmission, communication, and radio engineers. These technologists were not interested in developing physical theory, but were concerned with implementing new technologies. This explains why in the textbook Principles of Electric Power Transmission by L.F. Woodruff, we find that there is a photograph of an oscillogram of the building up of a charge on a transmission line. The picture shows the line charging up in steps exactly in accordance with Theory C of Ivor Catt. However, the interpretation given this experimental result, is not consistent with Theory C , but with the old theory that the results are due to traveling waves of voltage and current. This approach sees the current and voltage waves as completely different phenomena and so the opportunity to develop Theory C was missed. The theory that was in use in the 1930s was based upon the Heaviside operational calculus. Unfortunately this was not the fully developed theory that was needed. The Heaviside calculus disappeared after WWII, and was supplanted by different mathematical methods. Before WWII, the Heaviside theory was applied to transmission lines, which were used for AC electric power transmission and telephone and telegraph. Transmission line theory was also used in radio applications but only for use in high frequency applications. It remained for the problems of digital circuit design in the 1960s in order for the idea that circuit elements needed to be viewed as transmission lines to be developed. During the 1930s the electron theory of electricity was gaining ascendancy as a result of the brilliant developments in electron tube technology, that used electron beams to amplify or more correctly control electric current. The transmission line theory was unfortunately an isolated specialized science based upon a theory that transmission lines consisted of distributed capacitance and inductance. This made transmission lines into circuit elements, and so traditional ideas of electricity and magnetism were applicable. This allowed the theory to be developed without recourse to the aether theory of Maxwell and Heaviside. Hence the aether could be dispensed with in transmission line theory, and the theory became simply an adjunct of network circuit theory. It is important that this viewpoint was ascendant when the transmission line was used in an entirely new application, the production of a short intense pulse of electrical power to drive radar magnetron tubes. The magnetron tubes were operated by what today is called a pulse forming network, but in reality the original version was simply a charged length of transmission line that was discharged through the operation of a switch. The charge of the transmission line line emerged at the speed of light with one half of the applied charging voltage and with a pulse length that was twice the equivalent length of the line, when calculated for the speed of light of the line. In other words, we divide the physical length of the line by the speed of light on the line, and find that the electrical pulse has a length of twice this value. This creates three problem questions: 1) Why does the pulse emerge with the speed of light?, 2) Why is the voltage half of that expected?, and 3) Why is the length of the pulse twice what is expected? These questions don’t have very satisfactory answers within the context of the currently accepted ideas regarding electricity and magnetism, while the Theory C of Ivor Cat does provide a completely consistent set of predictions. The objective of the Wakefield experiments is to examine the voltage waveform of a pulse forming transmission line, at different points along the line, in an effort to prove that the Catt Theory C is consistent with the experiments, while the currently accepted theory is refuted. There are essentially two experiments. One which charges up the line and discharges it into a matched impedance load resistor at one end, and a second experiment that connects both ends of the same line to a matched impedance load resistor through a switch. The objective being to demonstrate that there exists two simultaneous energy waves that are reflecting in a continuous circulation. When the switch is closed in the first case the Catt theory predicts that the energy in the charged line breaks up into two separate waves moving in opposite directions, each having half of the charging voltage. In the first experiment, the wave that emerges into the load has half the voltage and lasts twice as long as the physical length of the line, divided by line velocity. In the second experiment, the pulse length measured at the load lasts only for the time calculated by dividing the physical length by the velocity. There is a third possible configuration, invented by Blumline, where there are two lines connected in series, and in which the voltage across the load, which is 2Zo, is the charging voltage, but this requires two lines of length L and the pulse length is also twice the physical line length. As shown at the top of this essay, the standard physics solution to the charged capacitor problem is an exponential decay. It was obvious as far back as the 1930s that this theory had to be false, if people were looking to test it. That evidence was certainly available when the experiments on charging long transmission lines were performed and published in the Woodruff textbook discussed above. However, people were not looking to falsify the standard conception of electrical charge in a capacitor. That was also not the case in the 1940s, when the discharge of a transmission line was used to drive radar magnetrons. In those experiments, which were turned into an established electronics technology, the charged line discharged a rectangular pulse, and it came out at the speed of light, which should have been recognized as an obvious contradiction of accepted physics theory. But is wasn’t. Why it was not is a good question, but it is not recognized today, and that is why the Wakefield experiments remain controversial, despite the fact that they are pretty definitive. Recapitulating the textbook theory based upon charge stored in a capacitor because of an electric field, there is one salient fact. that is that the theory requires that electric charge has to move to charge up the plates in the capacitor. It is well known that this movement of electric charge, in the form of electrons, is very slow compared to the velocity of light. However, in the experiments that involve a discharge of a transmission line, the pulse that is produced travels at the speed of light and so the pulse can not be the result of a discharge of a capacitor as taught in physics textbooks. The pulse moves at the speed of light and as is very well known, and completely established beyond any doubt, charged electrons can not move that fast. The theory also predicts , on the basis that as the charge flows out of the capacitor as a current, that the voltage decays according to an exponential function. The experiments show conclusively that this does not occur. The voltage waveform across the load is a rectangular pulse. The motivation for the Wakefield experiments is to nail down that these experiments do indeed verify or validate the Theory C of Ivor Catt. There remains the two additional problems of why the voltage comes out at half the charging voltage and the other one is why the pulse length is twice that to be expected. Theory C explains both of these questions without difficulty. However, the fallacious answer to the voltage question is hard to dispel. That explanation claims that the voltage comes out at half the charging voltage because the voltage divides between the impedance of the transmission line and the matched load impedance. So the combination acts as a voltage divider. It turns out that this misconception is the accepted explanation and it seems almost impossible to dispel, using logical arguments. Hence, the recourse to the Wakefield experiments as an attempt to demonstrate that the voltage divider effect is absent in the actual measurements made inside the transmission line. Those experiments show that the voltage doesn’t fall to one half the voltage until the backward wave reaches the open end of the line and reflects. This explains why the pulse is twice as long as one would expect. What happens is that there are two waves. One going forward and the other backward. These add together to make a long forward pulse at the load that is twice the electrical length of the line. The second Wakefield experiment conclusively proves that there are two waves, one forward and one backward. In the second Wakefield, both ends of the same charged line are connected in parallel to two matched loads. The two pulses that emerge are equal to the electrical length of the line. That is both the forward and backward waves flow into the load at the same time in parallel. The voltage in this case is half of the charging voltage but the length of the pulse is half that measured in the first Wakefield experiment. The motivation of the Wakefield experiments is to confirm and validate Ivor Catt’s Theory C. The results confirm the predictions of Theory C and are not in accordance with the current physics textbooks. I’ve a cat, or at least I had one. She would bring home a live mouse to allow her kitten to learn by doing. Ivor Catt has also set a trap for the unwary. Wakefield carefully says that the second experiment ends when “The pulse that emerges is equal to the electrical length of the line.” It is left to the reader to work out that there are now two lines in parallel discharging into the resistor. The pulse now is at full voltage for ¼ of the time of the first pulse and the energy dissipated in the resistor is the same in both cases. Now why can the physics teachers not see that their way of looking at the discharge of the resistor is not correct? Because, like me, they have many times proven by observing the steady fall of the needle of the voltmeter that the decay of voltage when a capacitor is discharged indeed follows the asymptotic law. Perhaps Catt has forgotten that winning an argument but making an enemy is not wise. He needs to prove that his opponent is right for the wrong reason. If the transmission line is not correctly terminated by resistor of value equal to the magnitude of its characteristic impedance then the pulse will bounce when it reaches the end of the line and the reduced pulse will carry on bouncing back an forth until it can no longer be detected. The important concept is that the current is not the moving electrons but the electromagnet pulse travelling at light speed. Of course a practical lumped capacitor has many characteristic impedances so that terminating it correctly is not possible. Henry, I think that you made a mistake in saying “The pulse now is at full voltage for ¼ of the time of the first pulse and the energy dissipated in the resistor is the same in both cases.” I am not sure what that means. In Wakefield I, the pulse is twice as long and has half the voltage, because when the switch closes, the circulation of power in the transmission line is interrupted. Half the power, the forward moving part, at 1/2 voltage, moves moves directly into the load, while the backward moving power is reflected at the rear open end and thus appears to double the length of the discharged pulse as it reflects back into the load resistor. In Wakefield II, the two ends of the line are tied together at a switch which connects them through matched load resistors to ground and so two loads are in parallel. Both the forward and backward power flow into the same load resistance at the same time, as opposed to Wakefield I where the backward moving power has to reflect before entering the load. This means that the pulse in Wakefield II lasts only as long as the length of the line divided by light velocity. The load therefore absorbs both the forward and backward waves at the same time. So it measures half the voltage for half the time of the Wakefield I pulse. In both cases the power delivered is the same, so in Wakefield II the current at the load is greater than in Wakefield I. 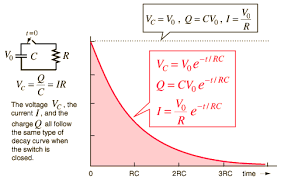 As explained by the Theory C, the exponential decay normally observed in the discharge of a capacitor is observed because the capacitor is small and the load resistance is much larger than the impedance of the transmission line. So that argument doesn’t disprove the fact that the Wakefield Experiments show that textbook theory is incorrect. Basically, the velocity of electricity is assumed be instantaneous in the textbook theory, which assumes instantaneous action at a distance applies.